Cost: Free of charge, though the banquet is $35 per person. Registration: Required - Register Online! A former professor of international law and politics. He is founder and director of Lamb & Lion Ministries. He is an expert on Middle East politics and the Jews in Bible prophecy. "An Overview of Israel in Prophecy: Past, Present, and Future"
"Israel and the Church: Has One Replaced the Other?" A former professor of Jewish Studies at Christ for the Nations Institute. In 2006 he was invited to become the spokesman for Zola Levitt Ministries. He currently serves as a free lance writer and speaker, focusing on Israel and the Jewish heritage of Christianity. Pastor of Faith Bible Church in Edmond, Oklahoma. He has a law degree from Oklahoma City University and a doctorate from Dallas Theological Seminary. He is a prolific writer who has produced more than 20 books related to Bible prophecy. Born in Russia of Jewish parents who migrated to the States in 1958. Founder and director of Ariel Ministries in San Antonio, Texas. He is a scholarly writer, best known for his book, Israelology: The Missing Link in Systematic Theology. Founder and director of Discovery Worldwide Ministries in Hurst, Texas. He is a recognized expert on the nation of Israel, having visited the country more than 100 times. He is an author and conference speaker. A member of the White House Press Corps. He publishes a news report called "Koenig's Watch," which is a weekly summary of important Middle East and world news. He has traveled extensively throughout the Middle East, meeting with both Arab and Israeli leaders. "The United States and Israel"
One of the most gifted Messianic song writers, performers, and worship leaders on the scene today. His albums of original songs have touched hearts all over the world. His ministry is based in the Dallas, Texas area. Jack wandered the streets homeless for 20 years before his life was transformed by Jesus. For the past 17 years he and his wife, Sally, have traveled the nation speaking, teaching, and singing. He is the featured singer on the Lamb & Lion television program, "Christ in Prophecy." 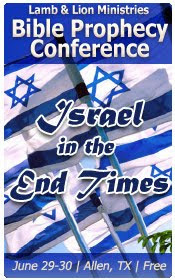 Let's keep comments for this page related to Israel in the end times and the conference. Thank you! The current crisis in Israel and the region will soon erupt culminating in the fulfillment of Isaiah 17, Psalm 83, and Ezekiel 38/39 which are one! I believe by the projected date of this conference, these will have been fulfilled! I am hoping LambandLion will give us the highlights of the conference. I'd really like to know what all these minds think and what has been revealed to them by the Holy Spirit. God Bless! “‘This is what the Sovereign LORD says: On that day thoughts will come into your mind and you will devise an evil scheme. You will say, “I will invade a land of unwalled villages; I will attack a peaceful and unsuspecting people—all of them living without walls and without gates and bars." Exactly when will Israel be "unwalled" and "peaceful" and an "unsuspecting people"? Because of these verses I can not see how these can all be one event. How awesome it would be to attend such an exhilerating event!!!!! I pray that dr reagan tapes the conference so we can purchase it for ourselves. I so want to meet nathan .. dr reagan and A.F. Yes, indeed, the DVD album will be available soon afterwards available on www.lamblionresources.com and we always turn the presentations into episodes of "Christ in Prophecy." So, even if you can't make it, we'll make it avaiable through other media at a later point. O! Thanks! I am VERY much looking forward to it! :) i just get the feeling the Holy Spirit will be at work doing some mighty things thru all of u to gain precious souls for the Kingdom. i will be praying while the conference is in session! Billy, there is no indication that Israel will not be expecting an attack as it is certain that the Western powers and their Sunni Arab allies are alerted to the Gog/Magog invasion force assembling to attack Israel (Ezekiel 38:13). The "unwalled villages" refer to the present Jewish Settlements that are viewed by the international community as an obstacle to peace. The Prophet Ezekiel clarifies this with identifying cities within the same prophecy (Ezekiel 39:9), this is a clear distinction here. Where does the primary force assemble? We know they are brought by the hand of the Lord from the north and therefore assemble at the northern borders of Israel (Syria and Lebanon)! The prophecy indicates that they will find their end in an open field (Ezekiel 39:5), I believe this to be the ancient fertile Plain of Bashan located in Southern Syria adjacent to the Israeli held Golan Heights. This is why I believe Isaiah 17 will be fulfilled in the context of the Gog/Magog battle as Damascus is reduced to a ruinous heap, a result of the earthquake recorded in Ezekiel 38:19,20 which also violently shakes the Land of Israel. Many scholars today deny that the recorded participants listed by Asaph in Psalm 83 are found in the context of the Gog/Magog invasion, therefore they conclude these are seperate conflicts, yet I will show however that these are indeed included. "And I will call for a sword against him throughout all my mountains (borders of Israel), saith the Lord GOD: every man's sword shall be against his brother"-Ezekiel 38:21. It is clear that the Prophet Ezekiel identifies that all those nations presently bordering Israel will slay each other as the present conflict between Sunni and Shia Islam finds an end on the borders of Israel. "O my God, make them like a wheel; as the stubble before the wind. As the fire burneth a wood, and as the flame setteth the mountains on fire; So persecute them with they tempest, and make them afraid with they storm. Fill their faces with shame; that they may seek thy name, O LORD"-Psalm 83:13-15. "And I will plead against him with pestilence and with blood; and I will rain upon him, and upon his bands, and upon the many people that are with him, an overflowing rain, and great hailstones, fire, and brimstone. Thus will I magnify myself, and sanctify myself; and I will be known in the eyes of many nations, and they shall know that I am the LORD"-Ezekiel 38:22,23. "So that they shall take no wood out of the field, neither cut down any out of the forests; for they shall burn the weapons with fire: and they shall spoil those that spoiled them, and rob those that robbed them, saith the Lord GOD"-Ezekiel 39:10. Isaiah 17, Psalm 83, and Ezekiel 38/39 are one, and will soon be fulfilled, for the Lord is determined to deal with all the enemies of Israel simultaneously! I thought that isreal would be unwalled... peaceful.... after the 7 yr treaty is signed. Right now they r quite the opposite and ready to fight today! The "unwalled villages" distinctly identify with Jewish Settlements in particular those of the Galilee!The Prophet Daniel also makes clear that war and desolations are determined until the end! There will be no peace for Israel without the Prince of Peace! The time of the Tribulation is also known as Jacob's Trouble therefore with all honesty, I do not agree with the hypothesis of most scholars in a secured peace for Israel guaranteed by the AntiChrist. If Jerusalem is to be a cup of trembling and a burdensome stone to all nations, then how is it anyone can see a time of peace under those conditions? I believe frankly, that the covenant with many that the AntiChrist initiates, is a nuclear disarmament treaty and universal economic plan, nothing more! If the AntiChrist was seeking to appear as a Messianic figure to Israel then why would he enter Jerusalem by force of arms, stop the daily sacrifice and defile the sanctuary of the Temple? Obviously confusion reigns in some eschatological circles regarding these events. I always wondered the senario that needs to occur to get some of nations in the outer ring of nations such as Libya, Sudan/Ethiopia, and even from the former Russian republics physically situated in the northern mountains of Israel as mentioned in Ezekiel 38/39. It would be helpful if someone has done any research on the military strategies of these Muslim nations that would get them positioned for this fulfillment. I have never heard anyone discussed this and would think someone with a military or political background would have provided their opinions by now. Speaking of the hook that pulls Gog down to Israel for plunder, this just in - Israel strikes oil off Tel Aviv coast. In Ezekiel's time all the major cities had protective walls. When he was given the Lord's description of the Israel of the future with no walls or gates (like greater Jerusalem today) it must be concluded that a people living in "unwalled villages" must mean they're living in "peace" and would be "unsuspecting." If that's the case, then Israel already meets that precondition for the Gog-Magog Battle. The news is saying that Israel is going to strike first. If Israel strikes first then doesn't that take Ezekiels battle out of the picture? I quote " U S Secretary of Defense Panetta says he believes Israel could act against Iran(a key player in the Gog and Magog war) as early as April. It goes on to say that various news agencies speculate that Iran could be at war with Europe, Israel, the U S or some combination this Spring." unquote. Ezekial says that Israel is the one being attacked not Israel attacking. I believe the Rapture is next eleminating the U S thus leaving Israel with no friends (The Church)setting the stage for the Antichrist to come on the scene to protect Israel with this false confirmation of the Covenant.Why would Christ make Himself known to Israel in the beginning and then have them looking to the Antichrist for protection. I couldn't disagree more that Israel is currently living in peace or unsespecting of attack. Only an ostrich with it's head in the sand could believe that. Israel is currently preparing for a potential war with Iran...hardly a state of peace. Israel is being bombared with rockets right now...hardly a state of peace. And to say they are unsuspecting? Are you kidding? They are on complete guard against potential threats. The reality of the situation is more of a nation on the brink of war, under attack, and on guard for more trouble. How in the heck am I wrong???!!! Well sue, if ur so inclined... i would love to gain ur insight in this conversation. I agree with billy about isreal not being in a time of peace in any way at all. Nathan.. interesting article ... i wonder whats gonna happen now. Iran.. im sure.. is hittin the roof over their discovery of oil. Phillip Goodman made this argument and I think it has some merit. From a 7th Century BC prophet used to seeing walls and gates surrounding every city and then learning that modern day Israel has no such defenses, plus with their humanist views obscuring their reaction to very serious threats, the argument could be made that Israel is in the prerequisite state ready for Ezekiel 38-39 to occur. This from our point of view certaily isn't the case, but it's something to ponder. It says "On that day thoughts will come into your mind and you will devise an evil scheme. You will say, “I will invade a land of unwalled villages...etc." Aha! Those will be the thoughts of those that invade Israel. It doesn't say this version which I am ALTERING to make my point: "On that day you will devise an evil scheme. You will invade a land of unwalled villages; attack a peaceful and unsuspecting people—all of them living without walls and without gates and bars." So what is being described is THEIR IMPRESSION of the condition of Israel prior to the invasion, NOT the REALITY of the situation. p.s.s. That doesn't apply to all my posts, however. Occasionally I think I have a handle on a subject. p.s.s.s. God bless! Hope to see you up in the air soon! Susie said "I agree with billy about isreal not being in a time of peace in any way at all." I appreciate that BUT definitely take it ALL in (I know that IS what you do) because everyone's (especially those with more knowledge than I) views help us in our desire to seek the truth. Okay, after going back and reading ALL of 38-39 again...and come across "Therefore, son of man, prophesy and say to Gog: ‘This is what the Sovereign LORD says: In that day, when my people Israel are living in safety, will you not take notice of it?" So, Israel WILL be in safety (which I do not think is the case now). This is all making the case for Psalm 83 and Damascus nuke first knocking out the Arab threat. Then an aura of safety around Israel's borders would be possible. That would then be followed up by Gog/Magog attacking an Israel in safety. So, I guess I'm finally buying into the Israelistine concept (to a point). I see a victorious Israel but not with the end result be an Israeli world superpower, rather the end result being Israel as the dominant middle east nation free from the threat of the the Arabs. Enough for me for now. My brain is aching. Billy, I believe this passage of scripture in which the Lord God addresses Gog indicates either false confidence or false security, the term "safely" provided within the context as the hebrew word betach has dual meaning! Israel today takes great pride in their military might yet with the overwhelming force being prepared by the hand of God to be brought against his people they will quickly realize that even this is not enough! Without the direct and divine intervention of the Lord God concerning Israel the Jewish State would be no more, yet the Lord God is faithful! Anthony, the current situation now in the region has made it possible for Libya, Egypt, Sudan, and many others to unite under the umbrella of the Muslim Brotherhood! This was accomplished by the West in their alliance with dominant Sunni powers and their terrorist militias such as Al Qaeda! The Shanghai Cooperation Organization (SCO) which includes China and Russia along with Iran and Pakistan in observer status also happens to include many of the former Soviet Republics within this organization. The S.C.O. is dominated by China and Russia and was formed as an economic trade bloc much like the E.U., yet now has also become militarized in strategic partnerships! Take a look at the membership within the ranks of the S.C.O., I believe you will find what you are looking for there! The situation now in the region of the Middle East rivals that of those included within the Gog/Magog Prophecy! Russia is currently providing strategic guarantee's for Iran as well as Syria, being a guard unto them as the prophecy reveals! The West which includes the United States and European partners under N.A.T.O. as well as their Sunni allies (Turkey and Saudi Arabia) are on the other side of the fence. Though the Lord God identifies that he will put hooks in the jaws of those that will assemble on the borders of Israel, there is no indication that they are all united on the same side at the time of their gathering! I believe the current clash between the Western backed Sunni and the Russian/Iranian backed Shia forces will have their last battle on the mountains of Israel within the confines of the Gog/Magog battle of Ezekiel 38/39! I agree with your comment. Thanks. Billy, your welcome! Iran is presently testing the defense capabilities of the Israeli Defense Forces. Recently the Gaza operation with rockets lauched by Jihad Islami into several southern cities of Israel was believed to be directed and coordinated by Iran. I believe very soon Iran will test the northern border of Israel sending Hezbollah rocket forces into action from Lebanon! This is just the beginning it will escalate more with each passing day! This morning according to israeltoday.co.il website...... there were 3 missles fired at beersheva. One was intercepted but two hit. No casualties reported so far and thank God the scbools were closed and people were in shelters. I was wondering if any of u think that the discovery of oil and natural gas could be "the hook in the jaw" for the gog/magaog war??? ?